During this period the moon reaches its first quarter phase on Thursday April 14th. On that date the moon will be located 90 degrees east of the Sun and will set during the mid-morning hours. This weekend the waxing crescent moon will set during the late evening hours and will not pose any problems for viewing meteor activity as long as you keep the lunar glare out of your field of view. The estimated total hourly meteor rates for evening observers this week is near 3 for observers located in the northern hemisphere and 4 for observers located south of the equator. The radiant (the area of the sky where meteors appear to shoot from) positions and rates listed below are exact for Saturday night/Sunday morning April 9/10. These positions do not change greatly day to day so the listed coordinates may be used during this entire period. Most star atlases (available at science stores and planetariums) will provide maps with grid lines of the celestial coordinates so that you may find out exactly where these positions are located in the sky. A planisphere or computer planetarium program is also useful in showing the sky at any time of night on any date of the year. Activity from each radiant is best seen when it is positioned highest in the sky, either due north or south along the meridian, depending on your latitude. It must be remembered that meteor activity is rarely seen at the radiant position. Rather they shoot outwards from the radiant so it is best to center your field of view so that the radiant lies at the edge and not the center. Viewing there will allow you to easily trace the path of each meteor back to the radiant (if it is a shower member) or in another direction if it is a sporadic. Meteor activity is not seen from radiants that are located far below the horizon. The positions below are listed in a west to east manner in order of right ascension (celestial longitude). The positions listed first are located further west therefore are accessible earlier in the night while those listed further down the list rise later in the night. The sigma Leonids (SLE) were first documented by Cuno Hoffmeister back in the 1940’s. Recent analysis show these meteors are active from April 8-25 with maximum activity occurring on the 15th. The radiant is currently located at 13:12 (198) +03. This area of the sky is actually located in central Virgo, 3 degrees east of the 3rd magnitude star known as Auva (delta Virginis). I’m not certain why this source is called the Sigma Leonids as even Hoffmeister placed the radiant in central Virgo, far from the star known as sigma Leonis. Perhaps back then there was a source of activity thought to be in southeastern Leo active at the same time? This radiant is best placed near 0001 local Daylight Saving time when it lies highest above the horizon. Rates are currently less than 1 per hour and may approach 1 per hour at maximum. With an entry velocity of 19 km/sec., the average meteor from this source would be of slow velocity. The delta Aquiliids (DAL) were discovered by Dr. Peter Jenniskens and mentioned in his book “Meteor Showers and their Parent Comets”. 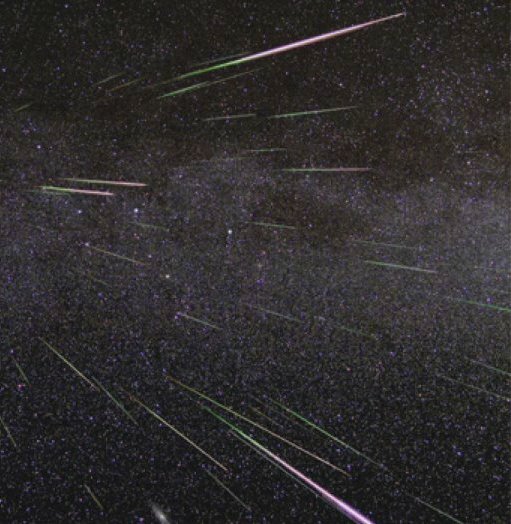 Recent analysis show these meteors are active from April 7-13 with maximum activity occurring on the 9th. At maximum the radiant is located at 20:32 (308) +12. This area of the sky is actually located in central Delphinus just north of the 4th magnitude star known as Deneb Dulfim (epsilon Delphini). This radiant is best placed during the last hour before dawn when it lies highest above the horizon in a dark sky. Rates at maximum are expected to remain less than 1 per hour. With an entry velocity of 63 km/sec., the average meteor from this source would be of fast velocity.